‘Chinese’ Meatballs – A Great Make-Ahead Appetizer! For the last several years I’ve hosted a “Women Only Pre-Holiday Madness Party”, usually on the first Saturday of December. We always have tons of fun! Everyone brings whatever they want to drink – and an appetizer to share, so there’s lots of “nibbling” going on all night. And, of course, the beverages are flowing! 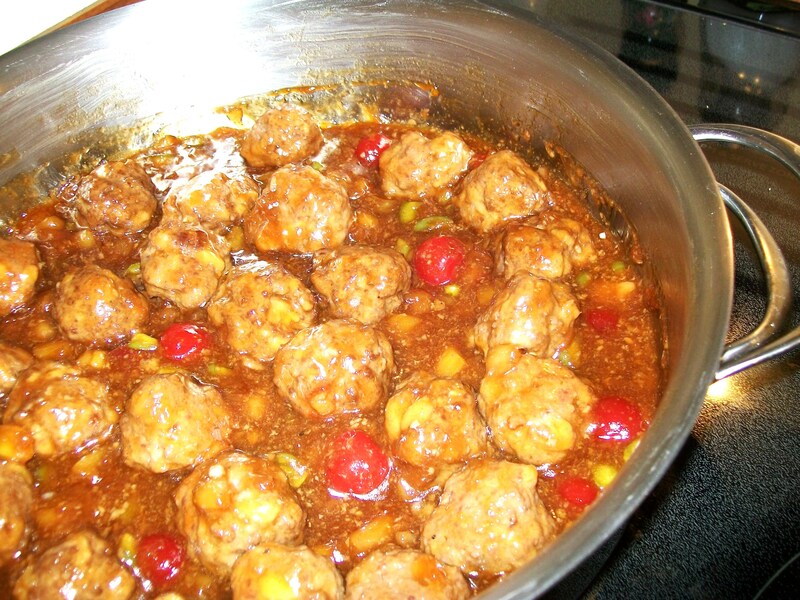 I invented these Chinese (or Sweet and Sour Meatballs) for one of those parties and they were a BIG hit. Take my word for it – these are delicious! FOR MEATBALLS – In a medium bowl, mix bread crumbs and milk, then add ground beef, egg, 1/2 tsp. Worcestershire sauce, 1/2 tsp. Teriyaki sauce, 1/4 cup DRAINED crushed pineapple – (reserve rest of pineapple and juice), 2 Tbs. minced onion, 2 tsp. maraschino cherry juice, 3/4 tsp. salt and 1/4 tsp. pepper. Form into meatballs 1 1/2 ” across. Place each meatball about 1 1/2″ apart on a baking sheet, and bake in a 375 F oven for 20 minutes. FOR SAUCE – In a large frying pan, place the rest of the ingredients – beginning with the cup of packed brown sugar down to the 10 maraschino cherries. On medium-high heat, bring sauce to a boil, while stirring. Once sauce boils, immediately lower heat. Add cooked meatballs and continue cooking – at a simmer – until sauce is slightly thickened and coats meatballs. ++ These can be made ahead and served the next day. I reheat them gently in an electric frying pan and serve them right from the pan so they remain warm. Of course, they can also be warmed up & served from your slow-cooker. Enjoy! !